When you use an iron blanket, how long do you soak it in iron and what % strength of iron is used in how much water? I’ve Never tried an iron blanket. 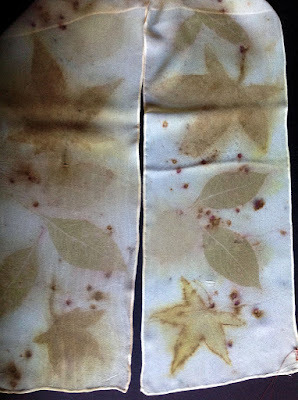 From your other posts it sounded like you had plants on a scarf, added the iron blanket that was a little narrower in width, and then pit all in madder dye bath? Peggy, I prepare an iron solution using rusty (or things that will rust) in a container of vinegar. Your container should probably be at least a quart (32oz) in size. To cure, put the items to be rusted in the container and fill with vinegar (leave about a 1/2 to 1 inch of headroom). Your iron solution will be “ripe” when it’s really nasty looking and has rusty foam on the top. After the solution is ripe I scoop out about 1 cup into a container filled with about a quart of water. I use old sheets as my “blankets”. I strip a piece of sheeting the size of my scarf blank and dip it in the iron/water solution until it is soaked through. People like to dry this blanket before use as there could be drips but I have not had any problem with it in my use so I just then cover my leaf covered scarf with the blanket and tightly roll. Hope this answers your question. Thanks so much. That helped me understand the basics. How did you get the madder just on the edges? It has to be one of the loveliest pieces I’ve seen posted. Thank you. Only the center of the scarf was wrapped and tied. The edges just floated in the dye bath. Thanks for the quick reply and forgive my many questions. or… the eco print was made first, then rebound only in center with cloth or plastic leaving the edges exposed for dye? 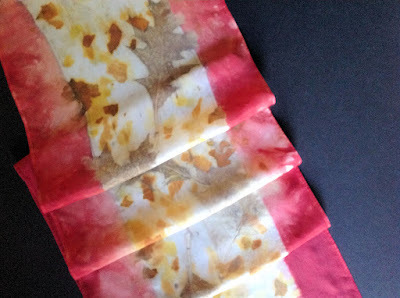 The botanicals were placed along the center of the scarf. An iron blanket, the same size as the scarf, was placed over everything. The scarf, leaf, blanket bundle was wrapped around a can that was placed at the end of the bundle in the center then rolled up. After rolling another cloth was wrapped around the center before tying with string. The the edges of the scarf and the iron blanket were loose in the dye bath and there were no string marks on the edges. I hope this helps answer your question.